Tourists go to Sapa to see women from indigenous tribes going about their daily lives in the market, on the streets and in the mountains around the town. We figured we would have to search them out…boy were we wrong! From the minute we got off the bus with our new friends Anke and Bianca, we collected a group of Hmong tribeswomen who spent the rest of the day following us around. After we checked into our hotel, they waited outside for us. When we stopped for lunch to get out of the rain they all huddled under an awning across the street and waited. The Hmong women continued to follow us into the local market and watched us try to haggle for handicrafts and clothes. Even leaving the market in a monsoon rain strong enough to flood the entire streets and turn stairs into waterfalls could not shake these women. When Carrie got into a fight with a shopkeeper over a broken poncho, the women looked on and supported our cause. The whole time they never asked for anything; just walked with us, talked about life and gave us a little sewn bracelet. Finally, after the monsoon and poncho fight, the other shoe dropped. We did our best to dodge the issue, promising them that if we didn’t book a tour that we would visit their village the next day, and it seemed to work. That is, until we walked out of our hotel the next morning and some were waiting for us. We wound up getting some silly musical instrument for way too much money, though I did get the woman to pose for a photo as well. In reality, we had planned to go with the local women from the day before. We wanted to visit their village and to buy something; but, we wound up booking an organized tour instead. A common saying in Southeast Asia is “same same but different,” and that certainly applies here. Our group was small and we had a private tour guide, but we left at the same time as a dozen other tours. Surrounding each group were a handful of Hmong tribeswomen, different from the ones who found us at the bus the day before. The women took turns talking to us, but shortly into the trip it became quite apparent which ones had claimed each of us. While they never discussed buying anything from them and they did not spend every minute by our sides, the little hand-woven gifts of leaves, stems and flowers or the fact that they held umbrellas over people’s heads to shade them from the sun during breaks gave it all away. My girl was 18 and very quiet, but she would wait with me every time I stopped to take photos to make sure I caught up with the group. Carrie had about three different women who claimed her. 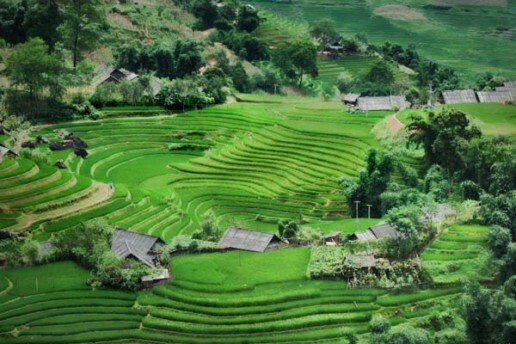 The reality of a Sapa tour — large groups and lots of locals. Sure, the interactions were fake and based on the assumption that we were walking ATMs, just waiting to be guilted into buying their overpriced handicrafts. But it didn’t matter and for half a day we wandered trough the mountains above Sapa, taking in the breathtaking views of hill after hill covered by rice fields and rice terraces. Never in all our Southeast Asia travels have I seen anything as awesome as the views from the trek. When we finally stopped for lunch, it was time for the tribeswomen to pounce. They did a good job of quickly laying down the guilt and telling us that we had to buy right then because there was another tribe, the Xao, waiting to walk with us for the rest of the way. Great, so we had to do this all over again?! At one point, Carrie was surrounded by more than a dozen women all showing her the same bracelet but at different prices. My girl had a wall hanging that I spent the next two hours haggling with to get a remotely fair price before finally buying it. Although I absolutely loved the trek and consider it a highlight of our time in Vietnam, I do have mixed feelings about the roles the tribeswomen play. Are they better off selling off their way of life to the highest Western bidder than they were when living the simple life? Is it wrong that they spend all day being photographed, often without their knowledge, just to keep their customers happy? I’m sure that 10 years ago they still thought a photo would steal their soul…now they pose for them without blinking an eye. Either way, I do feel bad for these women who spend their entire day following around Westerners on the off chance they will spend a buck or two. I just hope they are happy. This girl, a member of the Hmong tribe, followed me throughout our trek in Sapa to get me to buy something.